theatercombinat | 23. - 29. october 2013 thoughts meet space beirut installation & open archive by claudia bosse at ashkal alwan, beirut (lb). thoughts meet space beirut is a suitcase version of the installation thoughts meet space, vienna june 2013. the installation created on site in beirut by claudia bosse in collaboration with günther auer, was developed specifically for the particular context. the installation unfolds, as a temporary archive, parts of the existing some democratic fictions collection combined with the sound recordings, photos and objects created and collected in beirut. an installative laboratory of thoughts, interviews and encounters. the installation was continuously expanded with the new on site created material until the end of the three week research residency at ashkal alwan. yesterday we opened thoughts meet space beirut and it was great! parallelly we continue working and changing the material. i also proceed recording interviews for the collection "some democratic fictions" in the installation - which is quite interesting concerning the sound of the recordings. as a space it creates an open laboratory, always changing and in development; opened 3 hours daily, which i like very much as a working process. the discussions about the material are super interesting. it is also interesting because is not that common here to use the technique of overlapping medias in the different areas of the space and the mutual informing of the sound and image objects, the resultant different combinations of hearing and seeing as well as the spatial multinarrative with the equal status of all information. and lecture between 24th - 30th october 2013.
an archive is a situation. an archive is constituted from a collection of things, thoughts and concepts. each constellation of the documents and materials re-informs the documents themselves, because the presence of the document with other documents is the present of its constellation, and the present of its interpretation in this space at this precise moment. an archive is always the present of its perception. after the use of the american interviews in the installation dominant powers – landscapes of unease (may 2011 in and outside the cartographic institute, vienna), some egyptian interviews became a part of the performance dominant powers. what is to be done then? in vienna and tunis, as well as in zagreb museum of contemporary art accompanied and intermingled with the installation biographical landscapes of new zagreb. this installation explored the concrete urban environment of new zagreb with the help of some residents, their memories and the conditions of their lives. the interviews of the local participants where encountered in the space of the museum with some other produced earlier in egypt. in february 2012 the archive was partially used in the public space installation and performance burning beasts in frankfurt. for this project in the displaced car bodies inside the city centre audio interview material of the archive was implemented together with sounds of music and descriptive reconstruction of media pictures representing failure of political orders. thoughts meet space in may/june 2013 was an installation in 18 different spaces where the interviews were confronted with media scenarios of spelling reality. here, for the first time, the majority of the archive material became part of this artistic operation called “thoughts meet space”, as a virtual space of three-dimensional thought presented in the old customs canteen in vienna accompanied by 2 performances in relation to the installation as a coproduction with tanzquartier vienna. all this material, including the interviews produced in athens is part of the overall project (katastrophen 11/15) ideal paradise. in april 2014 what about catastrophes? premiered in tanzquartier vienna. in september 2014 in dusseldorf was the world premiere of catastrophic paradise in coproduction with FFT dusseldorf in the framework of the series "DECOLONIZE! performative strategies for a (post)colonial age". in this context took place the symposium politics of paradise and catastrophes. thoughts meet space athens in october was a site-specific multimedia installation at Bhive in athens, turning the neoclassical villa into a talking house, speaking with voices of the transnational archive of thoughts. the installation thoughts meet space cairo presented at hotel viennoise the nomadic archive. 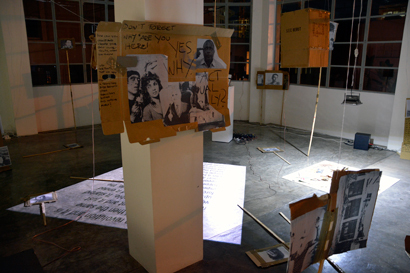 for the second time interviews had been conducted in cairo after 2011. the installation was accompanied by a 5 day event called reflection zone that functions as a discoursive and performative salon with contributions of artists and theoreticians based in cairo. in april / may 2015, at the donaufestival in krems the performance and installation a first step to IDEAL PARADISE created a workroom about rituals and political thought. this work was the first sketch for the series IDEAL PARADISE that is the final of the overall project (katastrophen 11/15) ideal paradise. in the last production of this series, the last IDEAL PARADISE, parts of the interview collection were confronted as video projections and audio stations with the material of the series IDEAL PARADISE.